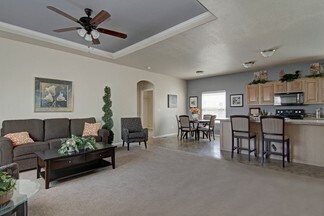 Palm Gardens Mobile Home Community provides only premier AZ Manufactured homes by Champion. See the wide array of offerings that make us the greatest name in senior mobile home parks. At the Palm Gardens Mobile Home Community, we know that everyone has an ideal living arrangement, and that is why we place emphasis not only on comfort and spacious living arrangements, but also on lasting value and adaptability. The Palm Gardens community is filled with Arizona manufactured home models by Champion. These home models provide wide-open living areas, multi-purpose rooms, and amenities such as en suites, walk-in closets, and covered porches. Other common home features you’ll find in our Arizona modular homes include screen rooms and sheds, skylights, bay windows, different landscaping packages, and stylish breakfast areas adjoining the kitchen. Easy to settle into and enjoy, these units are smartly designed, adaptable, and ready to satisfy your unique layout preferences. Floor plans on our AZ manufactured homes range from our park model alternative of 700 sq ft model to a deluxe 1,700 sq. ft. living space. Champion has been acknowledged as a leader in the manufactured housing industry and one of the largest modular homebuilders in North America. Champion was founded 61 years ago as a single manufacturing facility in a small town in rural Michigan. Contact us today to schedule a tour with one of our Housing Consultants and to learn more about our facilities, amenities, and community opportunities – we offer tours 5 days a week and on weekends by appointment only. When you are looking for active adult communities, there are few who could parallel the depth of options and the value of Palm Gardens in Mesa, AZ. We truly are the premier name in Arizona’s senior mobile home parks. The Palm Gardens manufactured home model center is open five days a week.